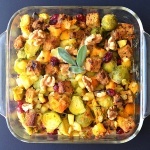 This is my new favorite Thanksgiving side dish! 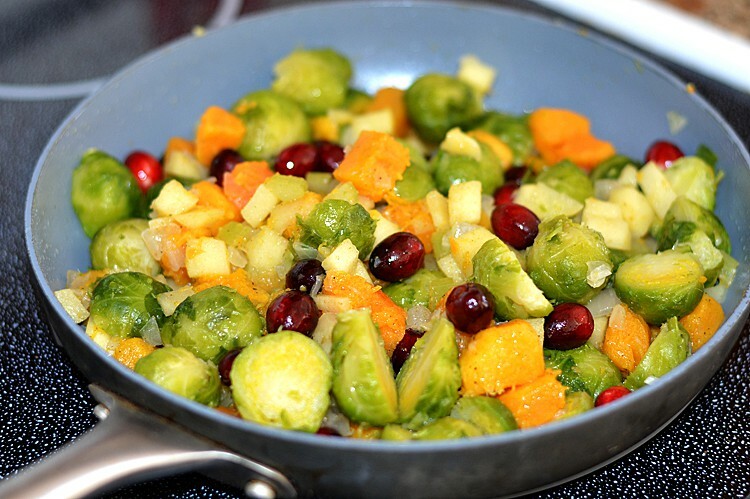 All of my favorites foods rolled into this Butternut, Brussel Sprout and Cranberry Stuffing. I had some of my leftover Cranberry Wild Rice Bread, so I used that to create my bread cubes. Just another layer of flavor. You could use any crusty bread to make yours. Day old and dried or toasted is best. This helps it to absorb all of the other flavors and the vegetable broth. 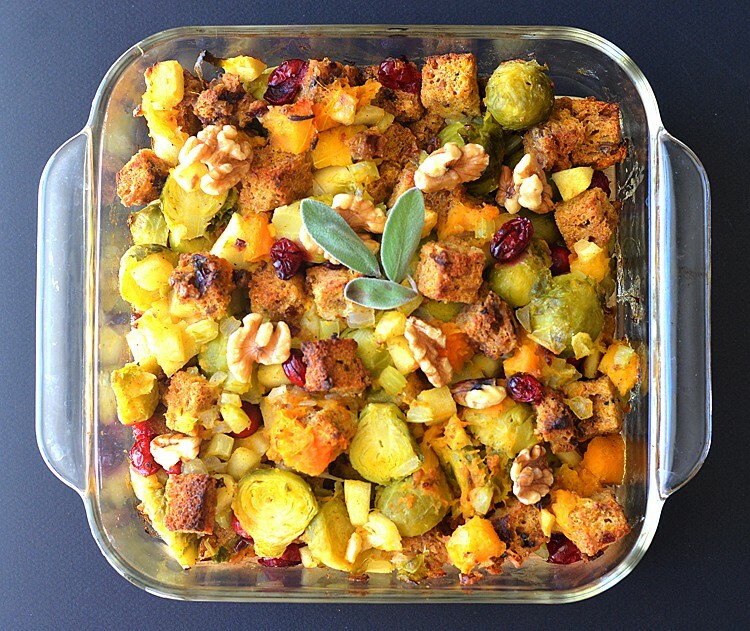 Halved brussel sprouts, cubed butternut squash, fresh cranberries, sauteed onions and celery, an apple and toasted walnuts round out this one-dish bake. Seasoned with salt, pepper and sage. If you don’t like sage, you could just use parsley. But I really think the sage gives it that “Thanksgiving” flavor. You could also use what is commonly known as “poultry seasoning”. Don’t worry, there are no animal products, just everyday spices such as: Thyme, Sage, Marjoram, Rosemary, Black Pepper, And Nutmeg. I toasted the bread cubes in my toaster oven. No oil, just the bread cubes. And everything else gets sauteed in a small amount of oil. Even the cranberries. Add these last and wait for them to just pop. This both softens them and releases their full flavor. Toss everything together with some vegetable broth and bake. It’s just that simple! Slice day old bread into large cubes. Dry for 10-15 minutes in the oven, keeping a close eye and tossing occasionally. Meanwhile, in 1 Tbl oil, saute the onions and celery until just beginning to soften. Add the squash and apples. Saute for until tender. Add the cranberries and saute until they just begin to pop or burst. Combine the toasted bread cubes and the vegetable/fruit mixture. Add vegetable broth to moisten. This will vary, but you want it moist but not wet. You can always add more during the baking process if it starts to dry out. If you'd like the top crispy, remove the cover and bake for an additional 10 minutes. I added the chopped walnuts after baking but they can certainly be added to the mixture and baked. Garnish with fresh sage leaves, if desired. This looks perfect for my family!! !